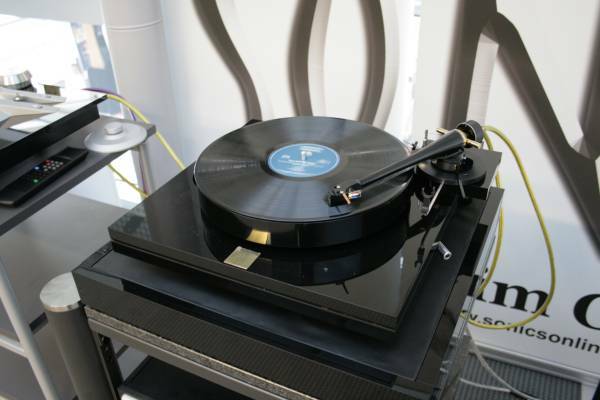 Joachim Gerhard, former Audio Physic loudspeaker brain, presented his new Sonics Spirit loudspeakers, together with Pierre Lurne's Audiomeca turntable and tonearm, equipped with Benz LP cartridge, amplified by Aesthetics Janus preamps and Pathos power amps. My Malene Mortensen CD sounded good, with very good resolution and very powerful, maybe slightly dominant, bass region, but with my Orff LP the analogue chain lacked soundstage and dynamics, unexpectedly. 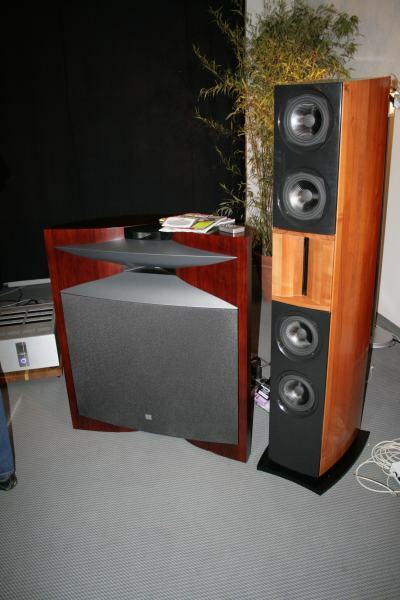 German loudspeaker manufacturer Isophon presented their new Arabba loudspeaker sporting all ceramics and diamond drivers. 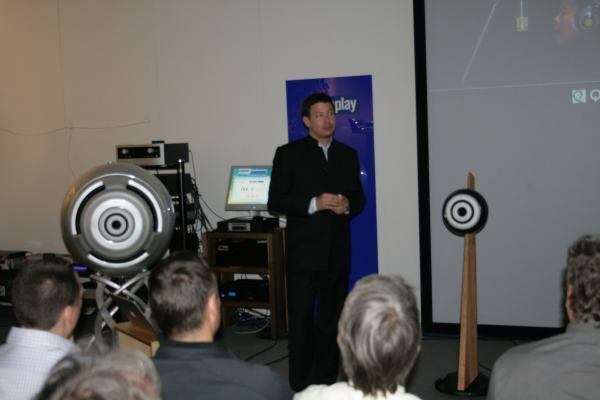 Amplification was with giant tube amps from Octave Audio, while Clearaudio took over the analogue duties. I had only opportunity to listen to my Orff LP in this room. Bass and treble was very good, with slightly less articulated midrange, but frightening dynamics and overall very good detail resolution. 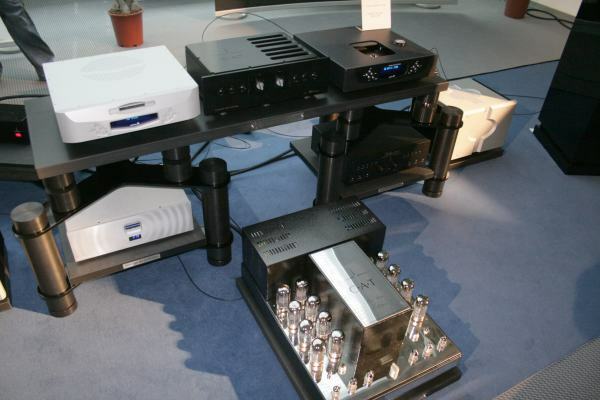 Naim Audio played their new 555 CD player through Super Nait into Allaes. Now that system really rocked with my Malene Mortensen CD. 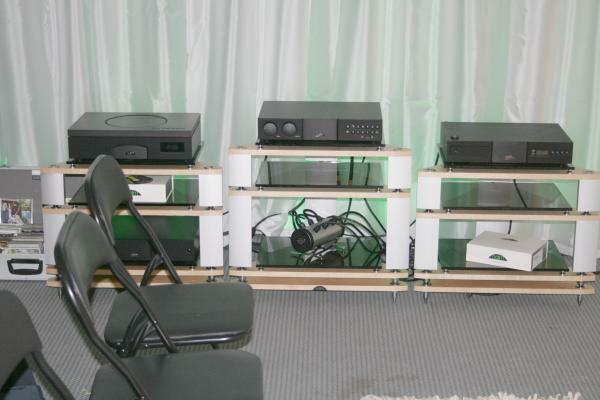 The setup had all the Naim virtues like spot on rythm and tunes, and had a quite remarkable resolution previously unknown for Naim. There was just a bit lacking treble, which reminded of the past. 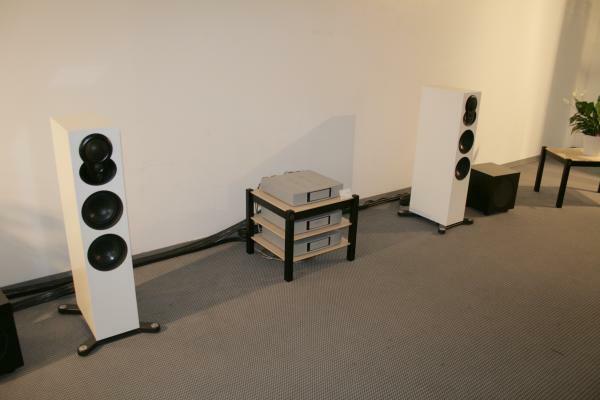 Compared to last year, when the Naim DBL was trying to sound coherent, this was way superior. 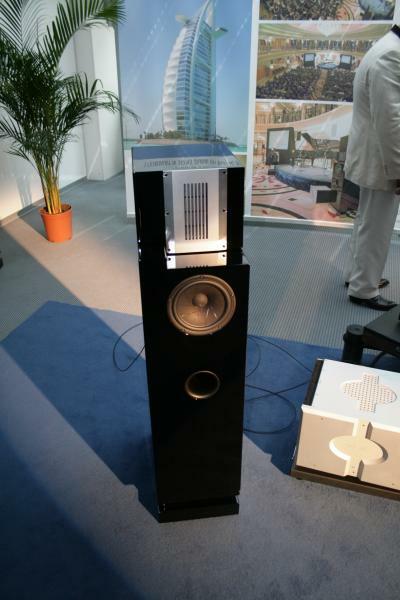 Finite Elemente, originally a manufacturer of equipment racks, presented their loudspeaker, "Modul LS". 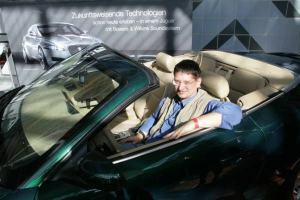 It will be on the market in autumn 2007, costing about 14 000 EUR. Without being able to listen to my own records in their show room (the demo-druid simply ignored my wish) these played world class on both CD and vinyl, being really fullrange with convincing and textured bass, and a natural transparancy. 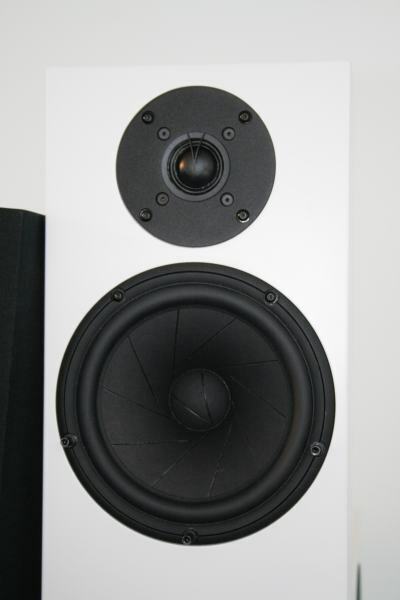 It has 18cm Scanspeak midrange, and two 30cm active woofers firing at the sides. Accompanying gear was Willi Bauer DPS with Schroeder DPS tonearm and Lyra cartridge. 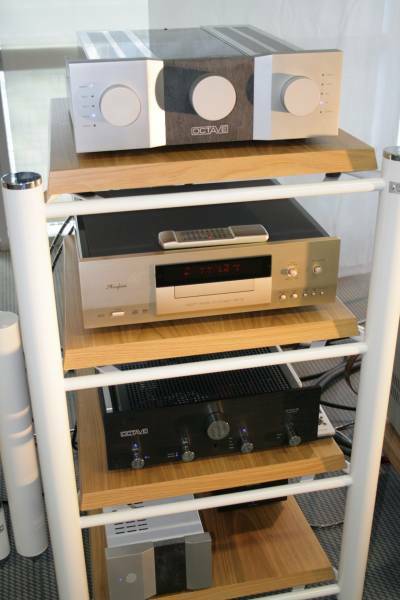 All electronics by Audionet. Of course I had not to miss to play my Orff LP on the Linn LP12 in its most enhanced variant, with Keel subchassis and the new Linn Ekos SE tonearm. 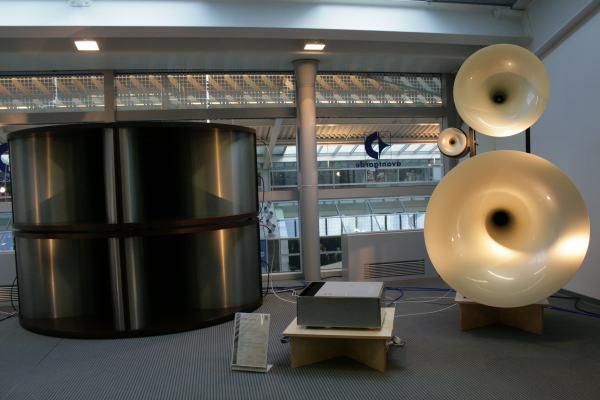 They had a multi-way active loudspeaker playing, with a pair of subwoofers. 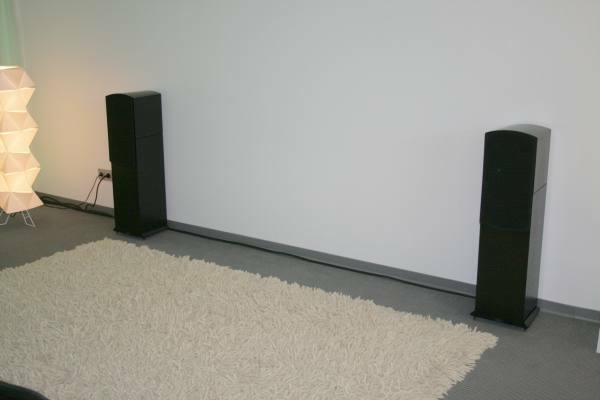 While I found midrange and treble unexpectedly fine and natural, compared to my own Linn LP12 experiences, bass was less textured, and lacked power and depth. 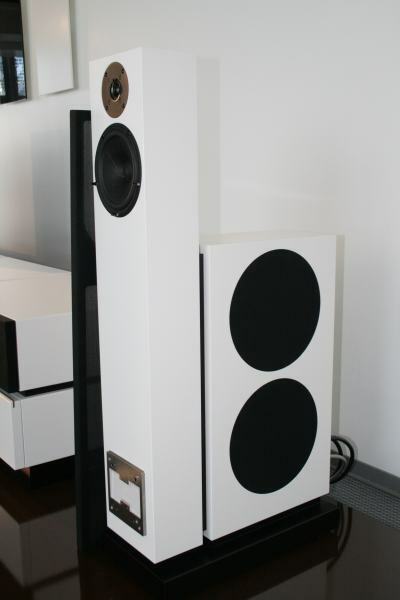 When playing my Malene Mortensen CD, I found the frequency response a lot better balanced, but bass region had a one-note quality, and the music fell apart into the single loudspeaker drivers. This meant, I could listen to tweeter, midrange and bass separately, and the parts did not gel together. 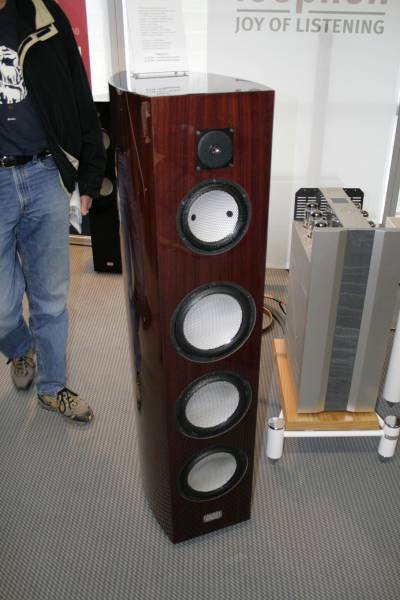 Ascendo is very famous for their loudspeakers with time-aligned tweeters. They had their new System P Quantum playing, with Belles power amp, CAT JL-2 Signature preamplifier, and Audio Aero Capitole Classic CD player. This was CD only, and I have to admit, I felt very uncomfortable with the music playing there. When Malene Mortensen was singing, I had the impression, that the CD had been reprocessed to enhance detail, similiar to the effect of Aphex Sound Exciter, where harmonics (distortions) are added to the music. Since all the components in this setup are unknown to me, I am unable to point my finger at the box to blame. Surprisingly for the effort in time alignment, listening had quite a very narrow sweet spot for the treble. Being about 3 metres away, but out of the center, moving the head 10cm to the side had big effects on treble attenuation. 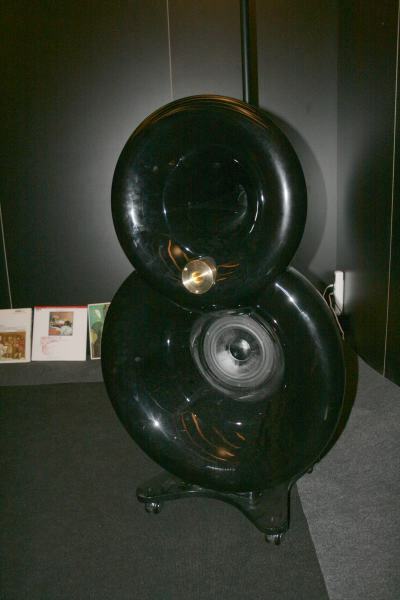 Avantgarde had their Trio system playing, with four bass horn subwoofers centrally placed between the left and right Trio system. Now this was playing extremely loud, but I had the feeling of too much softness and fuzzy soundstage. Then the bass did not gel together with the satellites, and had no texture at all! Last year, when the biggest version of Duos were playing, I liked Avantgarde a lot better. So bigger is not always better. 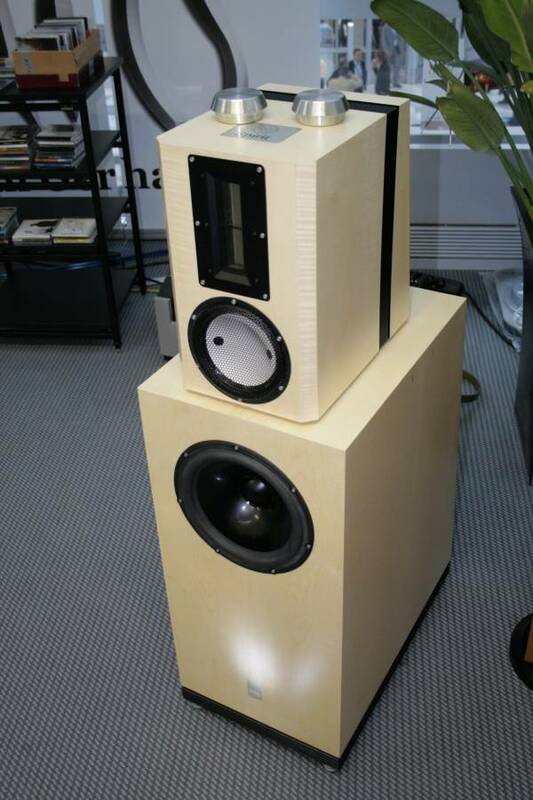 Haniwa, new on the market, had their three way horn with Electrovoice drivers and Fostex tweeters playing, helped by DSP processed frequency divider. Ampflification was by Air Tight, and vinyl source was a Denon DP-1300Mk.II, with their own Haniwa moving coil cartridge. Now, as long as their own soft classical LPs were playing, everything was OK, but when they put on my Brian Eno/David Byrne "Life in the Bush of Ghosts" the system choked and sounded distorted. German Audio Magazine, had a quite interesting shootout prepared for demonstrating passive loudspeakers against active loudspeakers. The candidates were JBL newest Everest and Backes+Mueller BM35 speakers. 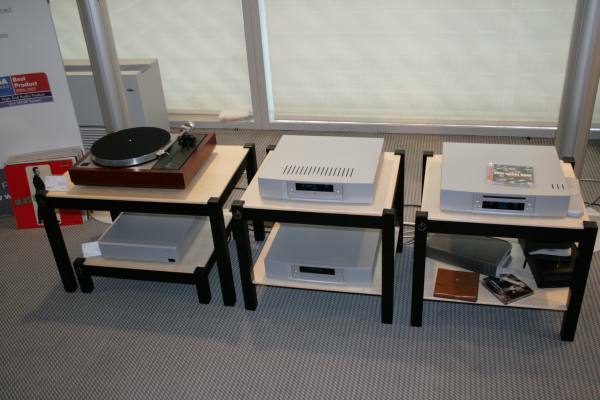 Amps and CD player were latest and biggest from Accuphase, and analogue source was a Garrard 501 by Loricraft. They played their own music on a schedule, so this was rather difficult for me to get an impression. By comparison, the JBL had great bass, but rather fuzzy midrange and treble, while the BM35 excelled in mid and treble, and even went into shutdown mode when playing at ear-bleeding levels. German Stereo Magazine had invited the two folks behind the audiophile Austrian label Quinton, to demonstrate mastering process steps. 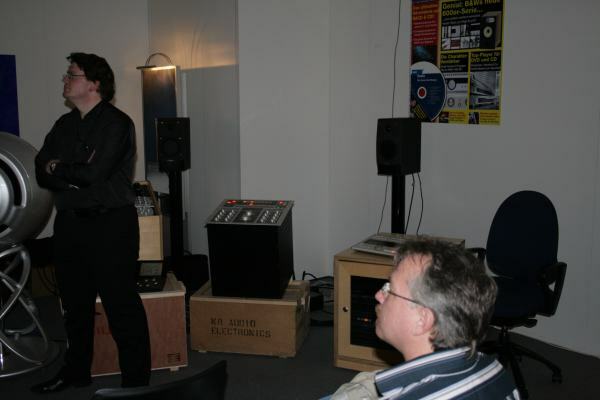 The audience was able to listen to compression effects, bass equalization and the like, before and after. Germany's vinyl magazine "LP" had a top DIY effort for display. 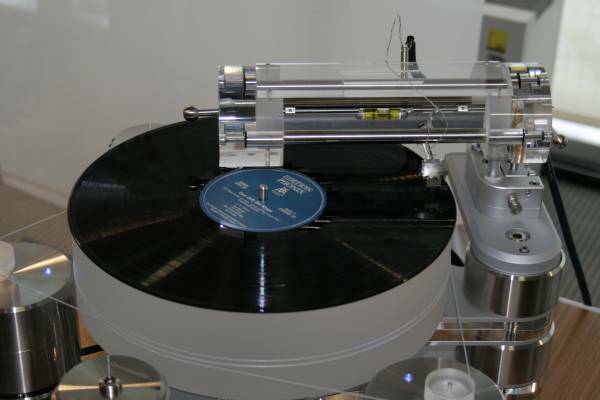 Note the syringe for adjustment of VTA by adding fluid into the bath tube of the parallel tracking tonearm. I know, and I hope you also know, that sounds at a show are a real hit or miss, with uncanny room acoustics, unclear power supply quality, electronics not warmed up for best performance, and maybe a lot of other vagueries. I tried to get meaningful listening experiences from the setups. Experiences, which help me to get an orientation and overview over world class products. 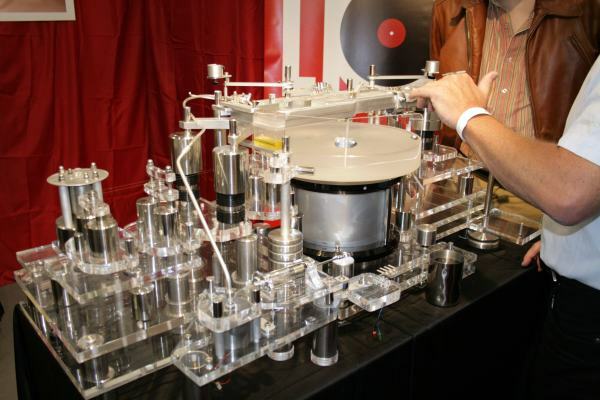 If I would win a lottery, I surely would buy me a Continuum turntable. But without winning, I can target my DIY electronics and my second hand turntable buys towards that sound. Then, I do not even dare to hope, that I am doing right to all the show rooms I described here, also to those, which I did not mention. I had only two tracks to listen to, and the result will vary with other music, no doubt. So please take my findings as very subjective perception. Your findings are likely to be different, when you had been at my place, but with your experience, your records, on a different day on the show. At last, when I do not like the sounds in a show room, it is rather impossible to name the component or structure, which is to blame. They had quite a few very expensive Car Audio solutions there, BMW M5 estate wagons (one genuine M5, the other one faked Diesel), and also Jaguar. See you next year!